His supporters are planning to press for an early parliamentary election. 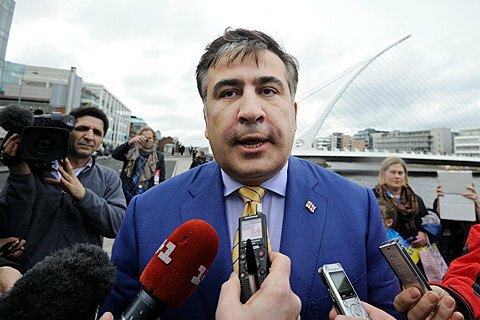 Mikheil Saakashvili, a former Odesa governor and Georgian president, has announced plans to hold a rally outside the Ukrainian parliament on 27 November. On Facebook, he said that the rally, which would take off from Vyacheslav Chornovil Monument at 1300 Kyiv times, is prompted by "the incapacity of Rada [Ukrainian parliament] of the eighth convocation to become an agent of change". "Our Sunday rally is entitled 'Last winter with this parliament'. We want an early parliamentary election in line with the law in effect. We want laws be changed to allow new blood to enter the next parliament," he said. Saakashvili argued the authorities were taking efforts to impede the rally under the pretext of the so-called "Crankshaft" plan, an alleged set of Russia-masterminded measures to destablised Ukraine. He denied his Movement of New Forces was paying people for participation in its rallies.